Despite the awful news about the robbery on LaVista, April was a fairly routine month for us crime wise for the most part. 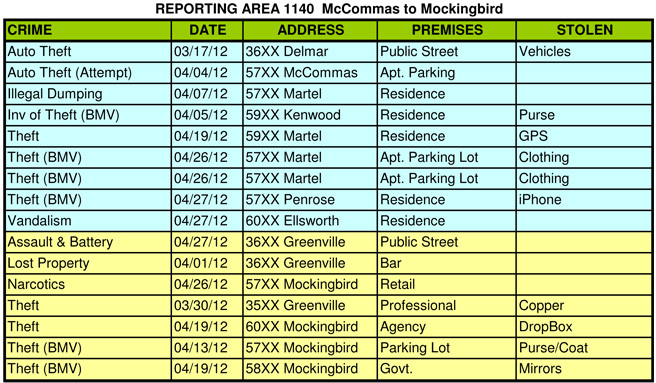 There were only 5 home break-ins throughout the area. We a couple of car break-ins that were two-fers. Two different cars were broken into near each other on the same night. These pairs occurred just 4 days apart, so possibly the same bad guy. 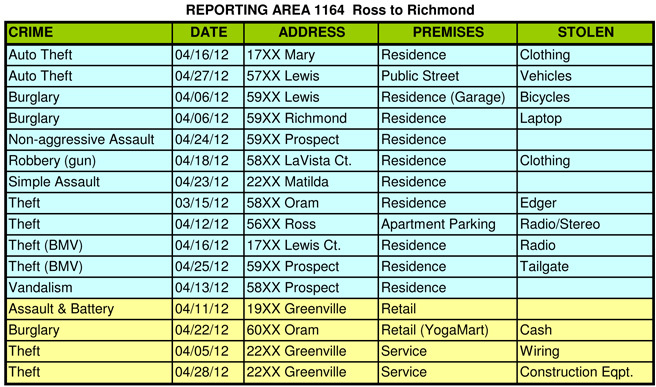 Again this month, in several of these car break-ins, the doors had been left unlocked and/or valuables in plain sight. This typically accounts for about half of the car break-ins. A few weeks ago, I sent an alert out about the robbery and attempted shooting that occurred on LaVista. I was concerned that this was connected to a similar incident on Morningside. I know this one caused a lot of concern based on the number of emails and phone calls I got after sending the alert out. As it turns out, there had already been an arrest in the incident on Morningside, so these were not connected. After the incident on LaVista, there were at least two more incidents in the area south of us (closer to I-30) that were connected. A witness in one of those cases was able to get a license number from the vehicle. Police traced this and have since arrested one of the two bad guys for the robbery on LaVista. They are still seeking the second suspect. The victim tells me that bail is set at $750K for the one in jail. – Always be aware of your surroundings and people who may be approaching you. – Listen to your instincts. If you feel something is not right, make your way to a safe location and call the police. – Avoid becoming so distracted that you are unaware of what is happening around you. – Don’t display valuables in a manner that makes you an appealing target for a would be criminal. – Finally, people traveling along the Katy Trail should always be aware of the call boxes locations along the trail.